I see the colors of the Italian flag in the photo. Nice soup! Can you believe, I have never made tomato soup? This must change. I was just thinking how good some tomato soup would taste... and no recipe. Great timing! This sounds like the perfect tomato soup. And your madeleines look wonderful. Browning the butter to bring out the nutty flavor is a great idea. I have done this with choc. chip cookies and they are much better. 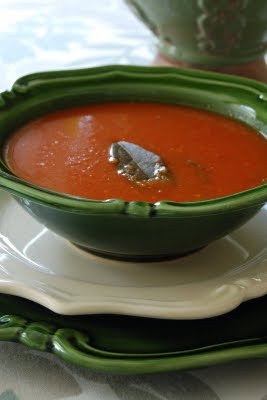 Juliana~oh, give this soup a try.It's so easy! Penny~Thank you for your kind comments. I agree with you about the browning of the butter~what a terrific aroma! I need to make this! I love the colors in the photos, Jann. Nice choice. What gorgeous photographs. The green with the red & white. Wow. You really have an eye for photography. This recipe sounds easy and good. I like the roux too.